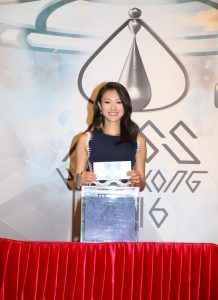 The 2016 Miss Hong Kong Pageant and Mr. Hong Kong Contest finals were held together on September 11, 2016, a first in pageant history. 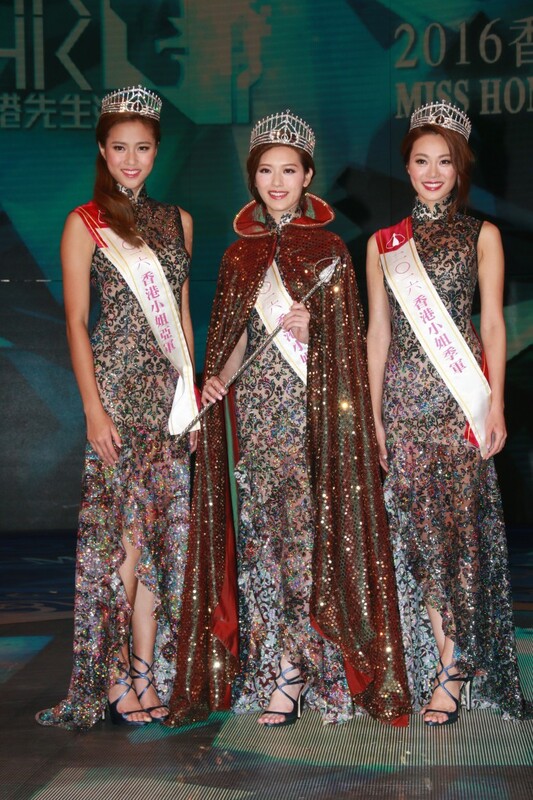 #6 Crystal Fung (馮盈盈) won the Miss Hong Kong crown with 36,679 votes. 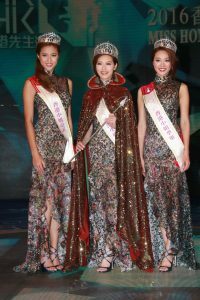 The popular #2 Tiffany Lau (劉穎鏇) won first runner-up and Miss Photogenic, while dark horse #7 Bonnie Chan (陳雅思) won second runner-up. From the Mr. Hong Kong side, #4 Jackson Lai (黎振燁) snagged the most votes and won first place in the contest. #9 Karl Ting (丁子朗) won second and #1 Freeyon Chung (鍾君揚) won third. Though preliminary rounds were held separately, this year is the first year in which finals for both contests were held concurrently. The Miss Hong Kong Pageant started out with 30 contestants in June, finally ending with ten finalists in late July. The ten finalists for the Mr. Hong Kong contest were eliminated down to four on Saturday, September 10. Carol Cheng (鄭裕玲), Natalis Chan (陳百祥), FAMA, and Bob Lam (林盛斌) hosted the Sunday finals. 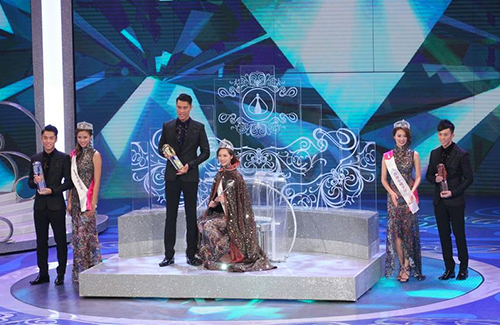 The judging panel for the Miss Photogenic award included Andy Hui (許志安), Gigi Leung (梁詠琪), Ruco Chan (陳展鵬), and Nancy Wu (胡定欣). Singer Hacken Lee (李克勤) was the guest musical performer. The ten Miss Hong Kong finalists appeared in custom evening gowns designed by famous local Hong Kong designers Leslie Lee and Kev Yiu. They captivated the judges with their unique charms and talents, and entertained the crowd with their witty responses to the “Q&A” portion of the competition. Known for her resemblance to former beauty queen Bernice Liu (廖碧兒), 26-year-old Bonnie Chan won second runner-up. 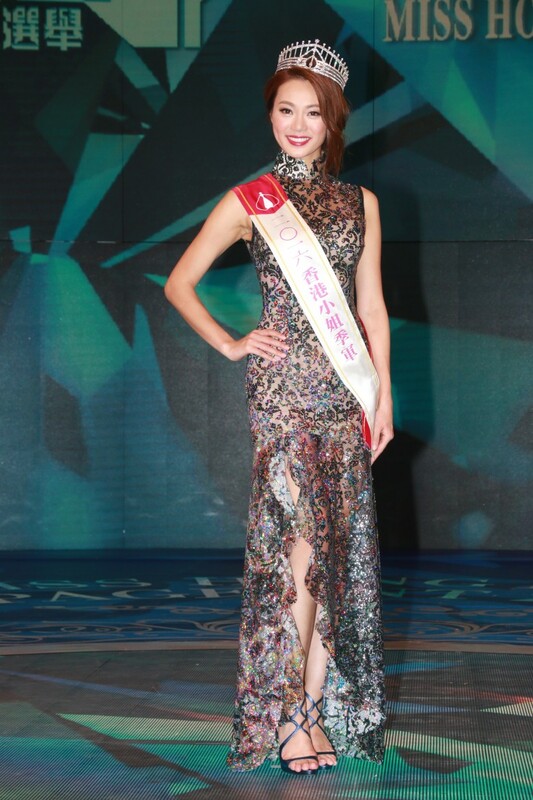 #3 Bowie Cheung (張寶兒), a friend of last year’s Miss Hong Kong winner Louisa Mak (麥明詩), won Miss Friendship. #5 Andrea So (蘇韻姿) made it to the top four. The 30-year-old and married Jackson Lai won first place in the Mr. Hong Kong portion of the contest, snagging 44,420 votes. Jackson cried when he received his trophy, and thanked his family. 19-year-old Karl Ting, who dreams to be a successful artist, won second place and the Most Popular Mr. Hong Kong award. 27-year-old Freeyon from Toronto, a musical theater artist, won third place. 19-year-old Christian Yeung (楊灌澤), nephew of veteran actress Ching Hor-wai (程可為), won Best Performer. #5 Wu Fei (胡㻗), younger brother of former Mr. Hong Kong Joey Law (羅天宇), came in fourth place. I didn’t watch the Q&A portion so I don’t know how they did there but while Crystal is pretty, I was surprised she won. The girl who was right next to her before the announcers named her the winner was pretty cute, imo. I thought she would win. She certainly fit the profile of a Ms HK looks-wise more than Crystal. @ivan i thought so too! @ivan I can see a small resemblance but he’s definitely not as good looking as Louis. He just looks like a composite of all the tall and dark guys at TVB. They could’ve picked someone else less generic imo. But on the bright side, I think this year’s Ms HK pageant contestants were better quality than before. However, there were no true standouts, from what I could tell anyways. But at least they were all pretty. @coralie wooden plus not good looking plus body is not nice, too lanky. wow interesting that Miss and Mr hosted together ! 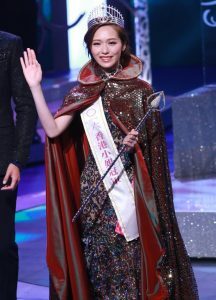 The winner of ms hk reminds me of Queenie Chu. That’s a very unflattering photo of Jackson. @isay Lol it certainly is. Haha. That’s probably one of the worst expressions someone can make in front of the camera and he was captured in the middle of it. Poor guy. His instagram photos look more winner worthy. I just found him on there and instantly thought, is this even the same guy I saw during the competition??! Maybe it’s the editing but dang .. Crystal is actually very pretty. She’s prettier than Louisa Mak (last year’s winner) when they are standing next to each other. @birchgirl Louisa Mak is not that pretty…she won based on her education. Crystal Fung is much prettier, pretty good choice.. Surprised that Mr Hong Kong has no requirement to be single…married guys can win Mr HK ? Just looks alone, I actually prefer the runner ups to the winner. Crystal is pretty but I agree with one of the comments regarding her not having the miss HK flair. I do have to say that I think the overall quality of this years contestants is pretty impressive compared to last year. Also, I think the Q&A/improv segment kind of loses purpose once the public audience becomes responsible for the top 3 placements. There isn’t an award to recognize good performance in the category either. I’m sorry but I think the public tends to be more biased towards looks alone rather than a good balance between looks and performance. Then again, who am I kidding. The pageant world has always been more leaning towards looks. 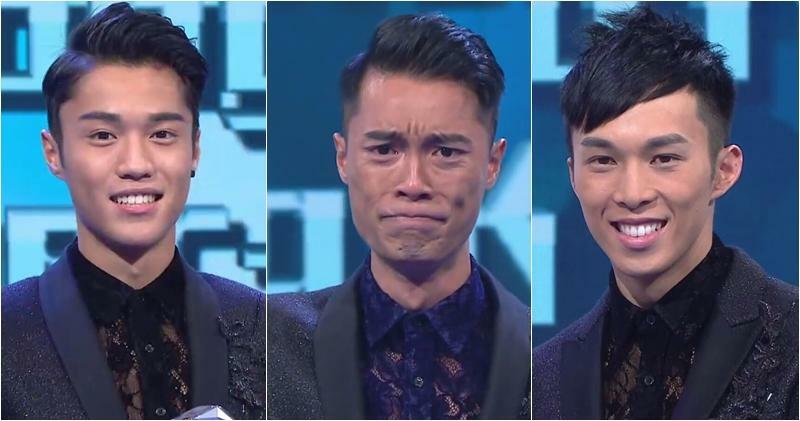 Forgive me, I totally forgot that there was a special panel of guests who were there to judge the contestant’s performances so that they can have a shot at signing with TVB. @fadoo MHK is still a “beauty pageant”. And to me, as long as it still exists, a beauty pageant should always be more about looks. If people want to compete more about smarts and knowledge, they should join a trivia or IQ game show. But obviously, the best combination is someone who is beautiful and smart–someone who seems to have it all. I wouldn’t want a winner who is ugly, but smart…it just isn’t what a “beauty” competition should be mainly about. @fadoo Well, both the 1st and 2nd runner up have curvier bodies, are not as skinny, and are taller. I think it has to do with the fact that Crystal just looks too “small”. When she is wearing the winner’s cape, it looks like it is swallowing her a bit. I think she would look better if she can (at all) gain a few pounds. I felt the same way when Shirley Yeung won MHK in 2001 as well. She is also very petite. Shirley is cute, but I thought the first runner up should’ve won, because she’s prettier and has a better body. I slightly felt that way about MHK 2013 Grace Chan (who is also scrawny and not that tall), but she has one of the best faces in MHK history and sounded very articulate in the competition, so I couldn’t argue her position. If she wasn’t drop-dead gorgeous, she wouldn’t have had that “flair” either. Usually the winner never do well or get promoted with TVB. There’s only a few exceptions of the winners of Miss HK who actually got promoted by TVB such as Sonija Kwok, Shirely Yeung and Grace Chan. That is usually the case and unfortunately Crystal is probably going to be one of them too. Not because I don’t see potential in her (I actually quite admire her confidence and how natural she spoke compared to the most of the contestants) but during one of the interviews after the competition, she mentioned that the reason she studies nutrition is because of her sick brother. She felt bad that she couldn’t do anything to help him directly so she decided to pursue a career that can help promote healthy living in other people. I don’t think she will give up something she sounds so passionate about. The more i look at Crystal the more she looks kinda horsey to me. She reminds me of Queenie Chu in looks but when she speaks she reminds me of Amy Kwok.